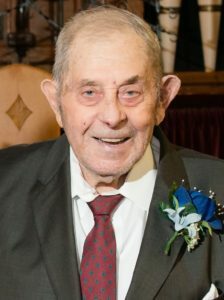 Whitehall-Ray J. Greenwood, 91, of Whitehall, NY peacefully passed away on Saturday March 23, 2019 at Glens Falls Hospital. Ray was born July 30, 1927 in Willsboro, NY. He was the son of the late William and Stella (Frenier) Greenwood. Ray was a devoted husband, father and grandfather who greatly enjoyed spending time with his family and dear friends. He will always be remembered for his great sense of humor, his love for hunting and fishing, and devotion to his community where he served on the Board of Trustees and was the Police Commissioner. He was a Navy veteran of World War II, serving in the Pacific Theatre. He was awarded the American Theatre, Victory and Asiatic-Pacific Medals for his service. He also served in the National Guard during the Korean War. He had an unwavering faith in God and was a communicant of the former Our Lady of Angels Church and currently Our Lady of Hope Church. He is predeceased by his wife, Mary Catherine Greenwood who died in 2015, his twin brother, Roy Greenwood and his older brother Edward Greenwood. He is survived by his daughter, Jane Beaton of Ballston Spa, NY, her son and his wife, Jeremy and Taylor Beaton, his two sons, Ray F. Greenwood and wife, Mary, of Newport Beach, CA, and Daniel J. Greenwood, his wife Suzanne, of Acton, MA, and their children; Nicole Greenwood of Riverside, CA, Amanda Greenwood of Columbus, OH and Christopher Greenwood of San Francisco, CA. Friends may call from 5 to 7 p.m. Thursday, March 28, at Jillson Funeral Home, 46 William Street, Whitehall. A Mass of Christian burial will be celebrated at 1 p.m. Friday, March. 29, at Our Lady of Hope Roman Catholic Church in Whitehall with the Rev. Rendell Torres, pastor, officiating. Interment with full military honors will take place at a later date in the Our Lady of Angels Cemetery on County Route 18, Whitehall, NY. In lieu of flowers donations can be made in memory Ray to either the Whitehall Fish or Game Club, c/o Pete Terry 3598 County Route 21. Whitehall, NY or Our Lady of Hope Roman Catholic Church, 9 Wheeler Ave., Whitehall, NY.